This time in 2018 tensions were high. Actually, they were off the charts. New Zealand, with just four teams in the mix, had two boats who had the opportunity to win the JJ Giltinan Trophy after 44 years. Honda Marine (Dave McDiarmid, Matt Steven and Brad Collins) and Maersk Line (Josh Porebski, Jack Simpson and Dave Hazard). No matter what the outcome, a New Zealand team was about to break the drought to claim the historic trophy. ASCC. 2019 JJ Giltinan 18′ Skiff Championship. As a whole and united group, the New Zealand team wasn’t phased with the outcome. If Honda Marine won, there would be a celebration. If Maersk Line won, there would be a celebration. No matter which team claimed the prize, the New Zealand team would celebrate. Because that’s what the Kiwi team is all about – celebrating each other, and being there for each other in defeat. As the day unfolded, it was neck and neck. But ultimately it would be Honda Marine who would write the fairytale story, beating out their team mates Maersk Line by just one point. The 44 year cycle had been broken, and the JJ Giltinan trophy was going to New Zealand. Fast forward to 2019. The goal for the Kiwi team was to win back to back JJ’s. Again, it didn’t matter which team took the triumphant moment, just as long as it was a Kiwi team. The Honda Marine team stayed the same. The Maersk Line team was now know as ASCC, with a young team jumping into the Maersk boat. It was a rocky start for ASCC (Josh, Jack and Dave), who broke a trapeze hook in one race and who had an unfortunate capsize in another, meaning they needed to carry a 13th in the overall results. In Race 1, they were called OCS which was an absolute joke, and as such they were reinstated into the results. Honda Marine saw the claws come out early against them, and also ended up in the protest room after the first race. Luckily the international judges on the protest panel saw through the allegations, and they held onto to their points with the protest against them dismissed. Honda Marine. 2019 JJ Giltinan 18′ Skiff Championship. It was clear from the start that the Kiwi team was strong, powerful, resilient and defiant. They were there with a purpose. They were there with a goal. With two races to go, New Zealand teams had won six of the seven races, and after Race 8, they had won seven from eight. ASCC took the gun in Race 8, but it was Honda Marine who took the overall win with a day to spare after crossing the finish line in second place. History was made after a mammoth two hour race. Honda Marine won back to back JJ’s. Job well and truely done! When they got back to the rigging lawn, ASCC and Honda Marine celebrated each others successful day, with fellow Kiwi teams C-Tech and Maersk Line joining in to congratulate their team mates. Tears were flowing, and the Godfather for the ASC (Auckland) Skiff League, Graham Catley said “bloody sensational”. 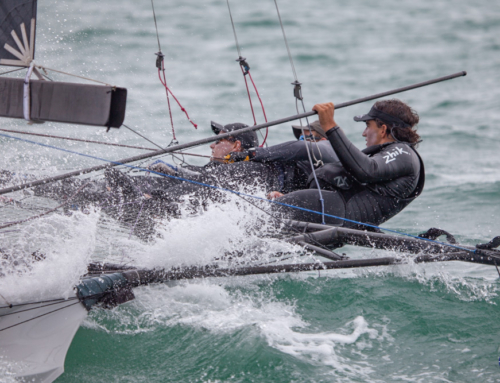 The Kiwi team, small but mighty, were heroes on the rigging lawn and across the sailing world. Now the goal is to ensure that the JJ Giltinan 18′ Skiff Championship is shared amongst the competing countries. It seems obvious that the event be held in New Zealand in 2020 – after all, the trophy now belongs to Honda Marine for another 12 months. The campaign has begun for the Royal Akarana Yacht Club / ASC Skiff League to host the championship at Easter time 2020. 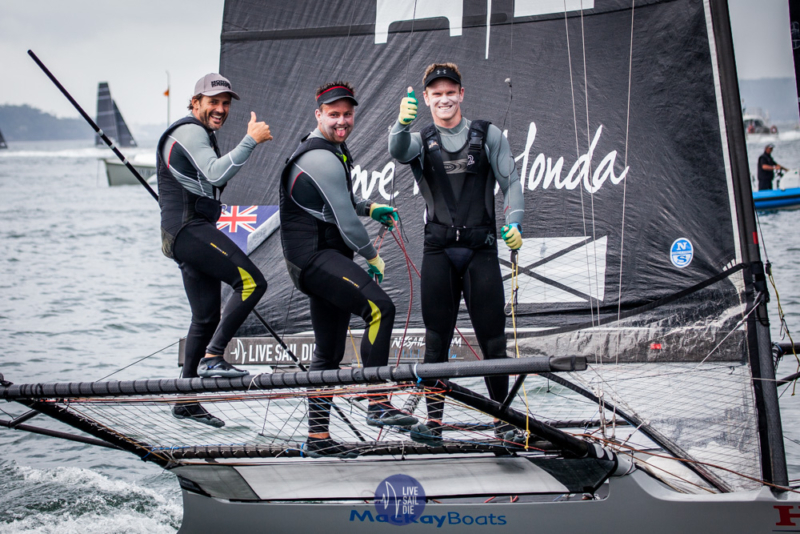 There are a few staunch personalities who will be dead against the idea, however for the 18′ Skiff class to grow and to progress into the next generation, its almost a requirement for the event to leave Sydney Harbour and to be raced somewhere new. It’s time for the JJ’s to head to New Zealand. If the 18′ Skiff Class is truely international, then the World Championship event needs to travel. It’s time this international class had an international presence and purpose. To Honda Marine, congratulations. You’ve made us proud to be a Kiwi team supporter. To ASCC, you’re a shining light, and to those who go up against you in 2020, look out. To C-Tech – never give up. There will be a time when everything falls into place. And to Maersk Line, the young but talented team with a future to be admired, keep at it. And for everyone in New Zealand who has considered getting into 18′ Skiff sailing, please get in touch with us. Live Sail Die will work closely with the ASC Skiff League over the next few months to ensure we have a pathway to grow the class and the fleet. After all, those who take on the 18 will be surrounded by champions. JJ Giltinan Champions, who call RAYC and the ASC Skiff League home. Dave, Matt and Brad – Honda Marine. 2019 JJ Giltinan 18′ Skiff Championship. C-Tech. 2019 JJ Giltinan 18′ Skiff Championship. Maersk Line. 2019 JJ Giltinan 18′ Skiff Championship. 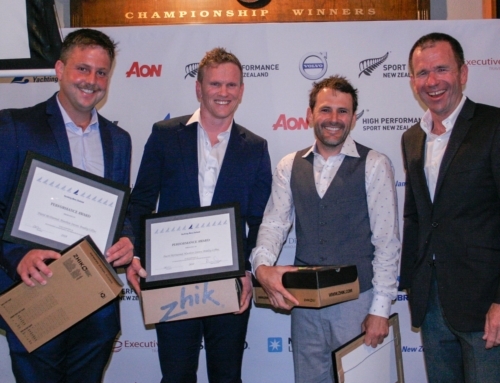 The New Zealand champion ASCC team of Josh Porebski, Jack Simpson, Dave Hazard, produced a brilliant performance to win Race 8 of the Winning Group 2019 JJ Giltinan 18ft Skiff Championship on Sydney Harbour. Despite the brilliance of the ASCC victory, the defending champion Honda Marine team (David McDiarmid, Matt Steven, Brad Collins) sealed the overall championship victory with an amazing 17 points (15 points, net) from the eight races sailed to date. ASCC won the start and quickly dominated the fleet, in the light South wind, to lead by 45s after a short beat across the harbour to the windward mark off Clark Island. The skill of the ASCC team was on display throughout the race as each challenge was repelled before ASCC crossed the finish line 2m3s ahead of Honda Marine, with Finport Finance (Keagan York, Matt Stenta, Charlie Gundy) just 6s further back in third place. The consistent Winning Group (John Winning Jr.) finished in fourth place, followed by the Australian champion Asko Appliances (James Dorron), and Smeg (Michael Coxon). With only tomorrow’s race still to be sailed to complete the championship, Honda Marine leads with a net 15 points, followed by Winning Group on 22, Smeg on 25, ASCC 31, Asko Appliances 32, and Finport Finance on 53 points. ASCC maintained the lead on the long spinnaker run to the Obelisk Bay mark, ahead of Honda Marine, Asko Appliances, Finport Finance, Winning Group, C-Tech (Alex Vallings), Vintec (Kirk Mitchell), Birkenhead Point Marina (Marcus Ashley-Jones) and Brisbane 18s (Dave Hayter). The long work back from Obelisk to Rose Bay produced a close battle in the leading group but the ASCC crew were always in control and maintained a 40s advantage over Honda Marine. Finport Finance was now in third place, however Finport was more than 2m behind the leader. Positions at the front of the fleet didn’t change over the next two legs of the course before Finport Finance made a move which saw her trail ASCC by just a couple of boat-lengths on the second run to Obelisk. Once again the skills of the ASCC crew was evident as they held off both Finport Finance and Honda Marine and still led by 15s after the fleet reached the Rose Bay mark. The battle between Honda Marine and Finport Finance continued over the final two legs of the course but ASCC was in a race of her own as she powered away for a great victory. Early wind predictions for tomorrow are for 18-20 knot NE winds which should some of the most spectacular racing of the entire championship.